In this paper we use Living Standard Measurement Survey (2005) to analyze the effects of remittances on the labor participation decisions of the Albanian non-migrants. We apply a micro-econometric two-sector labour supply model where the individuals remaining in Albania are allowed to choose among several labour market alternatives (non-employment, part time, full time and extra-time) together with the choice of being selfemployed or wage workers. The estimated coefficients of the utility function indicate a positive effect in average of the remittances’ receipt on the preferences for leisure for both males and females. However, using the estimated coefficients of the utility function to simulate the effect of a percentage increase in remittances on hours worked, we find that non-migrant substitute income for leisure only in case they are wage workers while a labour incentive effect is observed for the self-employed. 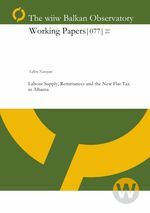 The flat tax would make labour behaviour of individuals in Albania more neutral versus remittances due to their shift in budget constraint especially in case of self employed.